There are so many images available online that it was hard to choose a model for her pocket. 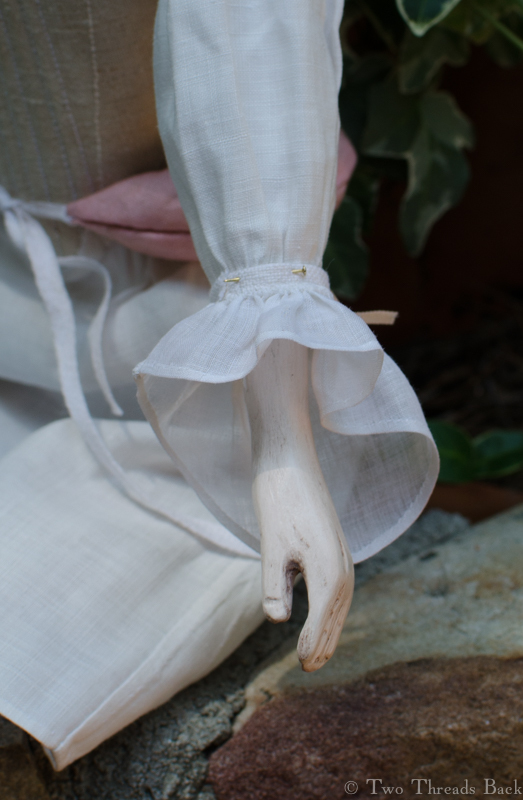 I finally settled on “the look” of a sweet little doll version in the online Pockets collection at the VAD. 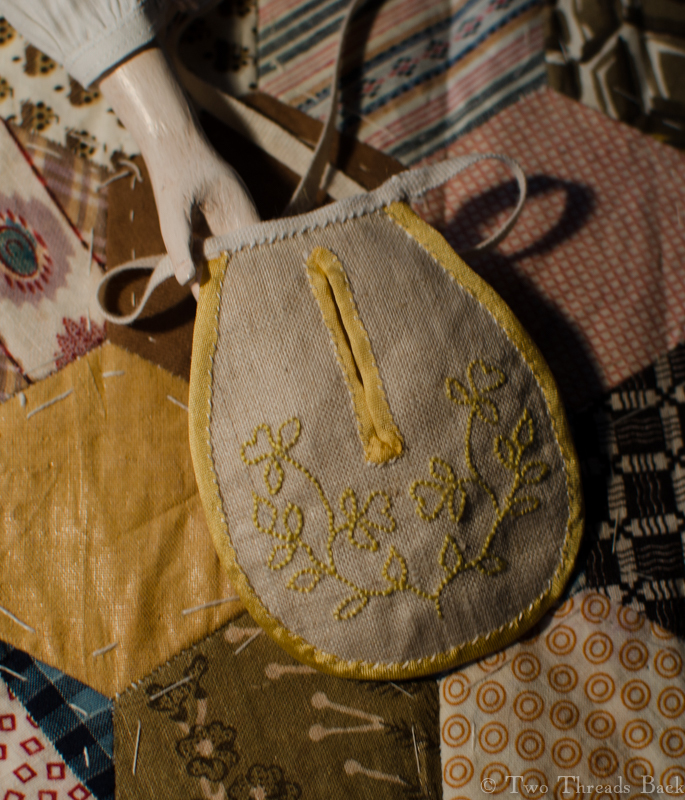 (Click the link and then search for “doll´s pocket Nottingham.”) It resembled a couple of others, also worked in yellow thread, that were made for women rather than dolls. And it only required a backstitch! 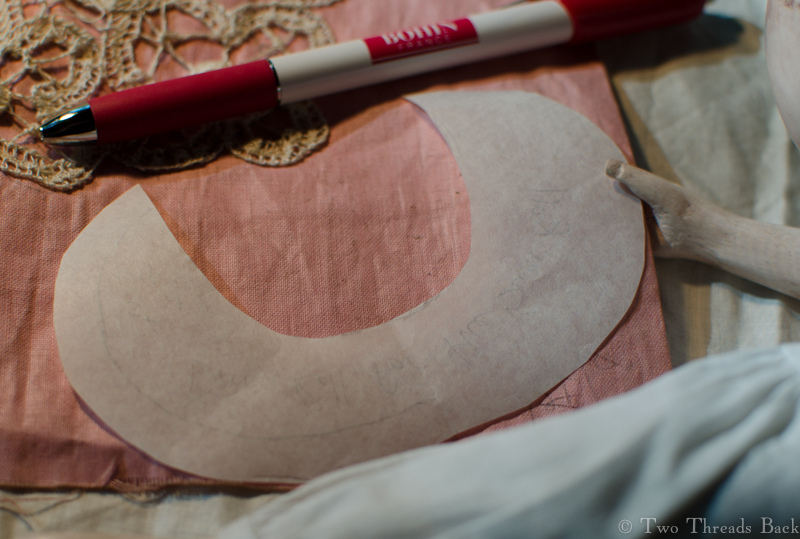 The pattern: traced, pricked, and pounced. 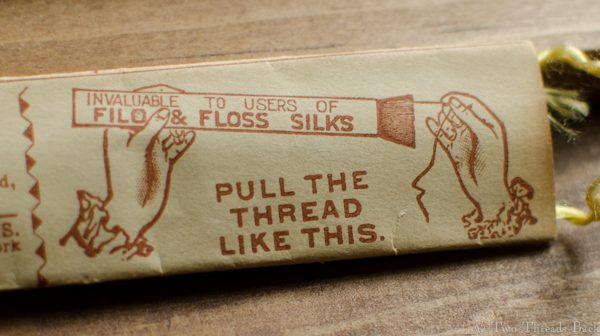 The fluff of canary-colored silk is the remains of my fight with the floss. 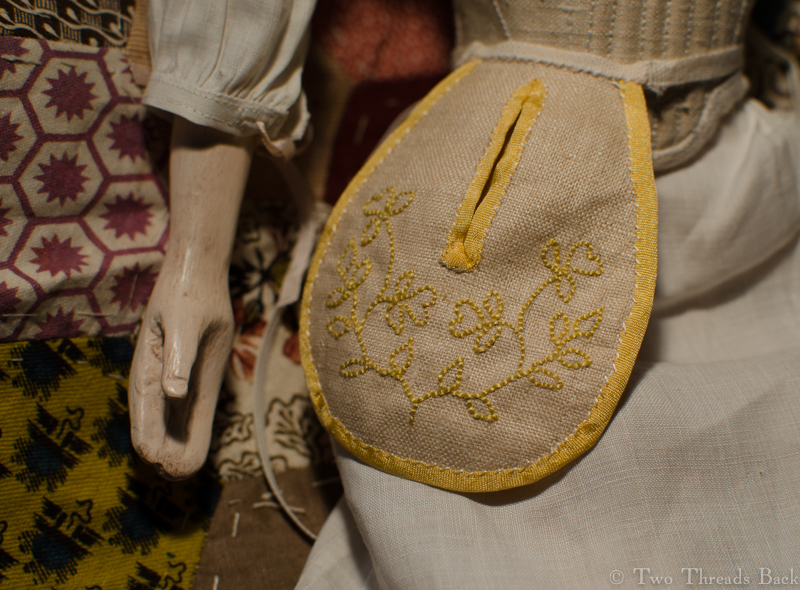 The design I used was loosely based on an 1770s pattern from The Lady’s Magazine. I scanned the original pattern and scaled it down to Pharaby-size. Then I raided a stash of old 1890s embroidery silks. I tried using the thread as it came from the skein, but it was way too thick – using only one ply made it almost small enough. And I can tell you that it did NOT work like the illustration on the wrapper! As you can see from the remaining yellow fuzz, it was a struggle. But once that was done, it was pretty simple to cut out the front and back, then bind them with some matching yellow silk. I tried. It didn’t work like the picture. To finish the pocket, I added narrow tapes on the ends. Yes, one MORE thing to go around her waist. 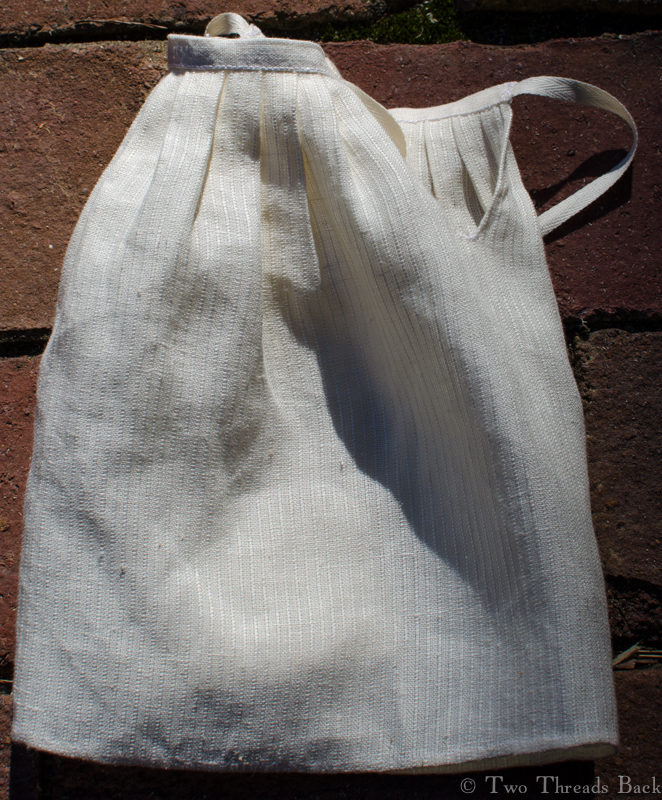 But now she has a place to carry her handkerchief – when I make her one. Oh! And while she was showing off her pocket, I took a picture of her wearing her marked shift. I neglected to do that in the last post, and she let me hear about it. Pharaby’s shift is now marked. They would certainly have some contempt for how long it took me to mark Pharaby’s shift, regardless of the quality of my work! I should have tended to this little essential when I first made it, but better late than never. We can’t have her single shift getting lost in the laundry, can we? 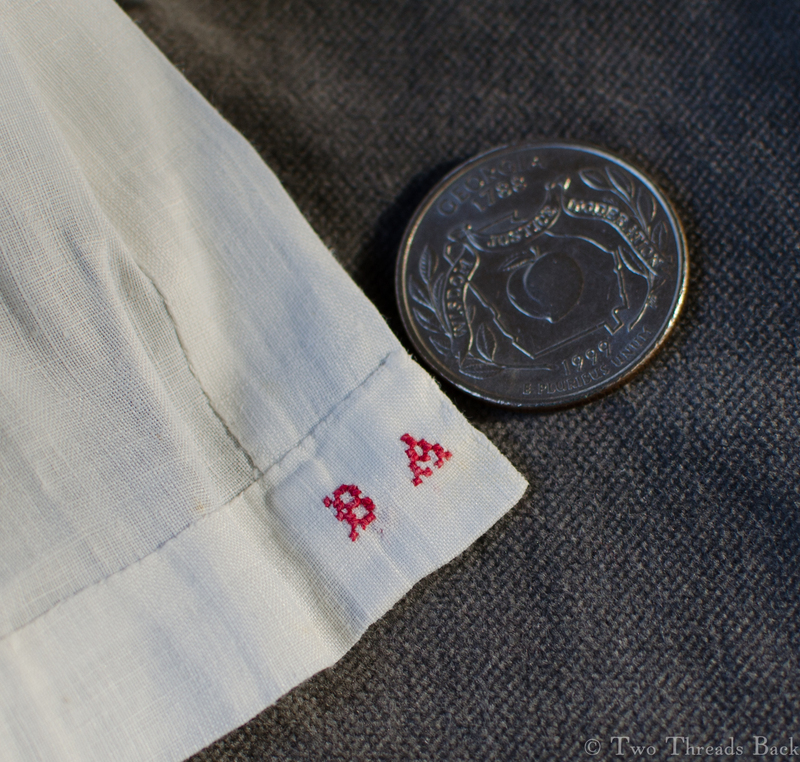 A lovely linen baby shirt marked with Turkey red cotton; note the quarter next to it for size. I’ve kept the image full size, for anyone who wants to view beautifully done original marking up close – just click the image. First I had to do some practice stitching. Sampler collectors and makers would laugh at how astonished – and intimidated – I am by the miniscule cross-stitches made during the past 200 years. 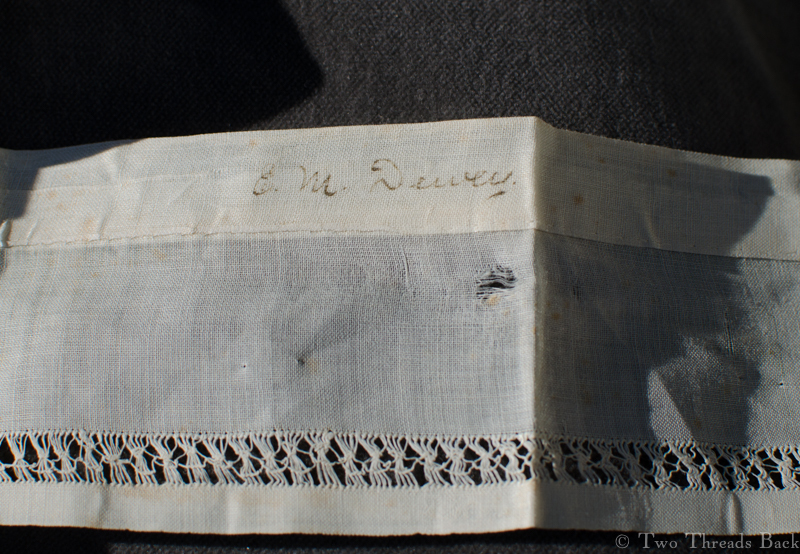 You can see from this little baby shirt (last quarter 19th C) how blithely they marked countless linens. I’m guessing at the “blithely” part, but since I have many shirts from this baby, somebody was doing a lot of marking! Making it to Pharaby’s scale would be impossible, since barely matching ordinary period work would be the best I could hope for. 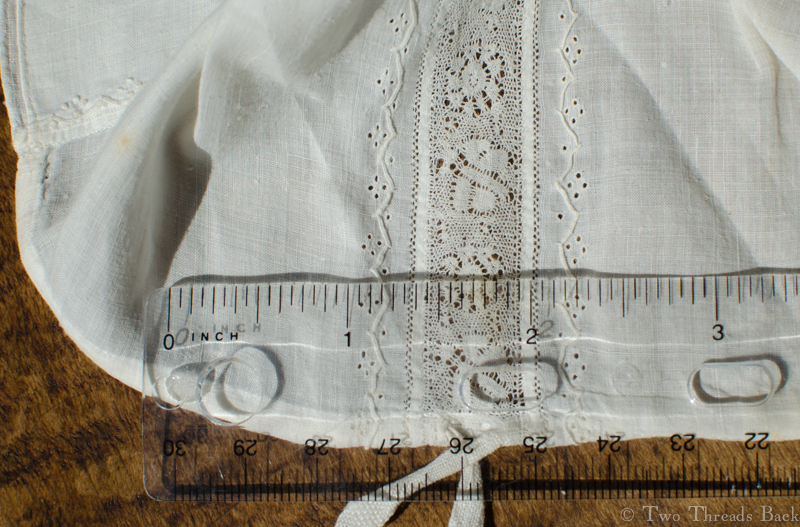 I used a pretty little c1900 linen collar to experiment on (damaged – I wouldn’t inflict my needle on it otherwise), as you can see in the picture. 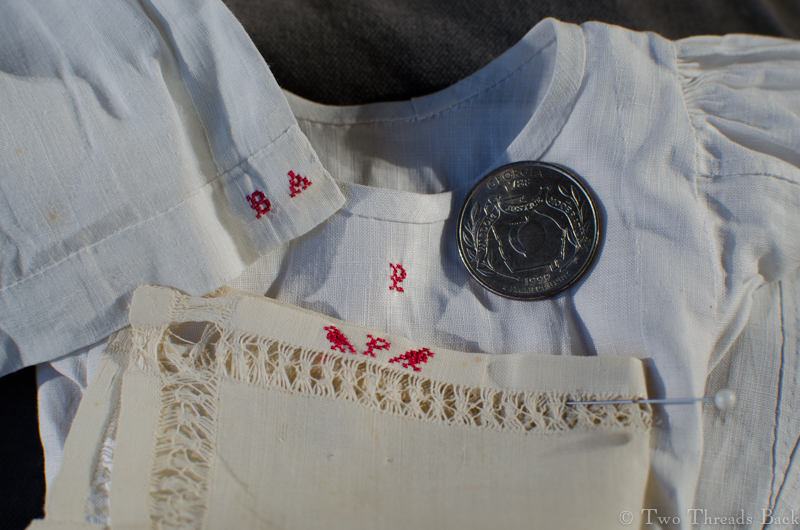 Since the threads in linen are not all exactly the same size, my stitches over two threads looked a bit messy. I tried sewing over four (too big) or over however many made a perfect square (too awkward). By this time I was just about ready to use ink, like the collar owner! But hey, I’m all about plain sewing, right? A lot of trial and error showed that to be small enough, I’d have to work over two threads, no matter how lumpy my letters looked. I found that just like many projects, things that look pretty awful as I’m working, look a little better when I’m done. Or maybe I’m just cross-eyed by then! The baby shirt, Pharaby’s shift, and the practice piece, all together. The little birds I tried were from a pattern by the most knowledgeable sampler collector I’ve ever met. Maybe Pharaby will make a sampler one day…. I’m sure ornamented stockings were worth a peep in the 18th century as well! 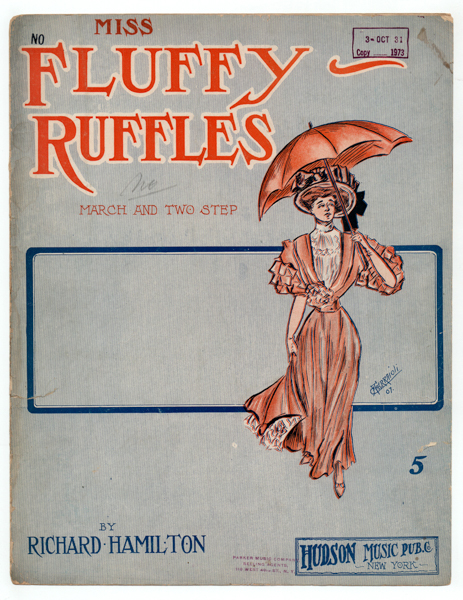 And did you know that wearing silk stockings could be hazardous to your health? At least during a thunderstorm. A late 18th century stocking, metmuseum.org. Her disease, like all others which the doctors can make nothing of, was decided to be a nervous one; but it was afterwards discovered to be owing to her wearing silk stockings, and wires in her cap. How little do our ladies imagine, when they surround their heads with wire, the most powerful of all conductors, and at the same time wear stockings, shoes, and gowns, of silk, one of the most powerful repellents, that they prepare their bodies in the same manner, and according to the same principles, as electricians prepare their Conductors for attracting the fire of lightning. Ladies may laugh at all this, but it is too serious a matter to be made a joke of. A very amiable lady, a Mrs Douglas of Kelso, had nearly lost her life by one of those caps mounted on wire. She was standing at an open window during a thunder-storm: the lightning was attracted by the wire, and the cap was burnt to ashes. Happily her hair was in its natural state, without powder, pomatum, or pins, and prevented the fire from being conducted to her head. A good strong head of hair, if it is kept perfectly clean, and dry, is probably one of the best preservatives against the fire of lightning. But so soon as it is stuffed full of powder and pomatum, and bound together with pins, its repellent force is lost, and it becomes a conductor. Hmm… personally (and modern-tastefully) I find the “loaded” hairstyle more repellent! But I digress. Pharaby most certainly wanted stockings, and I wanted to make them. Well, I wanted her to have them. To be honest, I was at a loss for how to make stockings, so first I spent some time searching for ready-made. What would fit her? Her limbs are not exactly the same size and shape (well neither are mine), and her feet are shaped to stand flat on the ground. Or table. So off-the-rack doll stockings, unless I was willing to accept nylon tubes, were not an option. I know what it’s like to have baggy socks around my ankles. I decided I’d have to make them after all. Knitting was out of the question since I don’t know how. The stockings would have to be cut and sewn. Pondering a source for slightly-aged stretchy silk one day, I experienced a flash of brilliant resourcefulness. Gloves! With silk lining! Ebay! I found a worn vintage pair that were just right and managed to extricate the lining from the leather. Next I found and adapted a pattern on this lovely site and practiced fitting it, using an old t-shirt so I wouldn’t waste the silk. That took a while, but once I settled on the size, I had another idea. Why not embroider clocks on her stockings? My brilliant ideas are often followed by some real flops, and so this one proved. 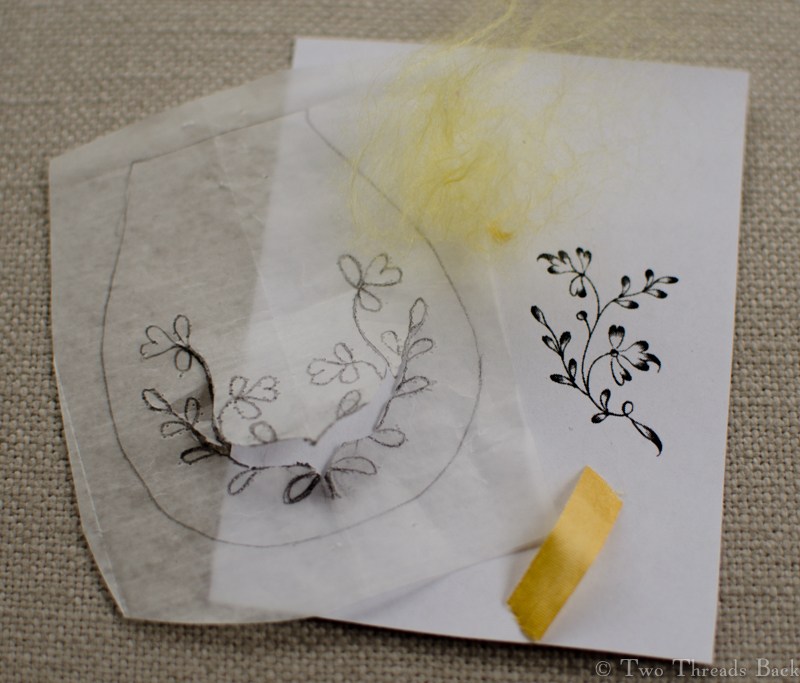 I made three attempts to embroider a half-inch design on thin stretchy silk. It looked horrible, no matter what thread or stitch I tried. There would be no clocks this time. Fortunately Pharaby didn’t know I was even trying, so she suffered no disappointment; she was pleased to have any stockings at all. They may be her only pair. We have a lot of thunderstorms. Pharaby has been following me with a reproachful gaze for a few weeks now. I promised her a petticoat (an “under” petticoat) and I’ve been awfully slow in making one. I finally got around to it this past week. 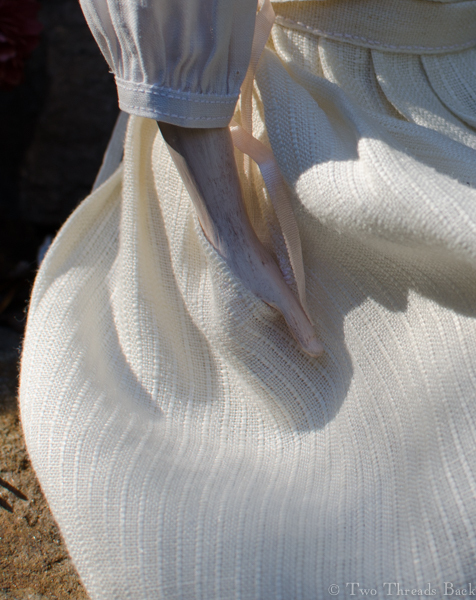 It was pretty simple really, just a length of ribbed linen stitched up the side and pleated into a band. Making the pleats match was the hardest part. 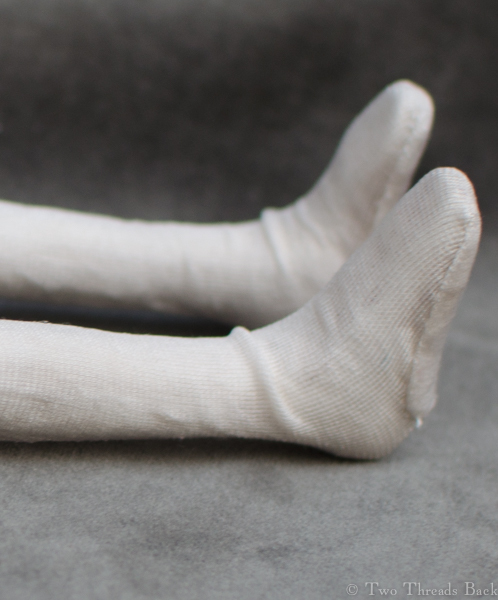 No, wait – finding a band to fit the doll “scale” was the hardest part! Just enough room for her to reach a pocket inside. When she has one, that is. I only had a small assortment of cotton and linen tapes to choose from. 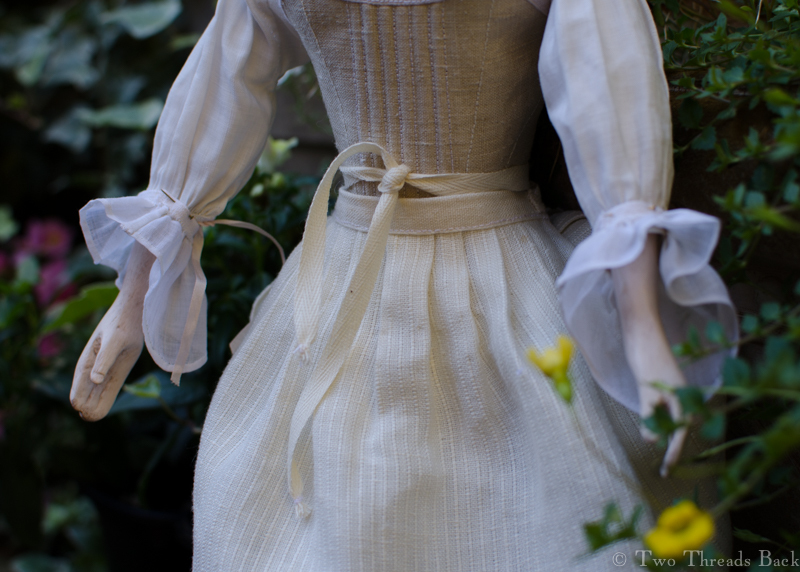 None was the exact size and weave I wanted, but, well, that’s how it is with dolls and costuming. You have to compromise! So now she’s got a petticoat. The next question is, does she wear it over, or under, the bum roll? We’ve tried it both ways and are hoping for some expert advice. But what really concerns me is the direction we’re headed: exactly how many ties, bands and layers of gathering can the female form support at the equatorial line? 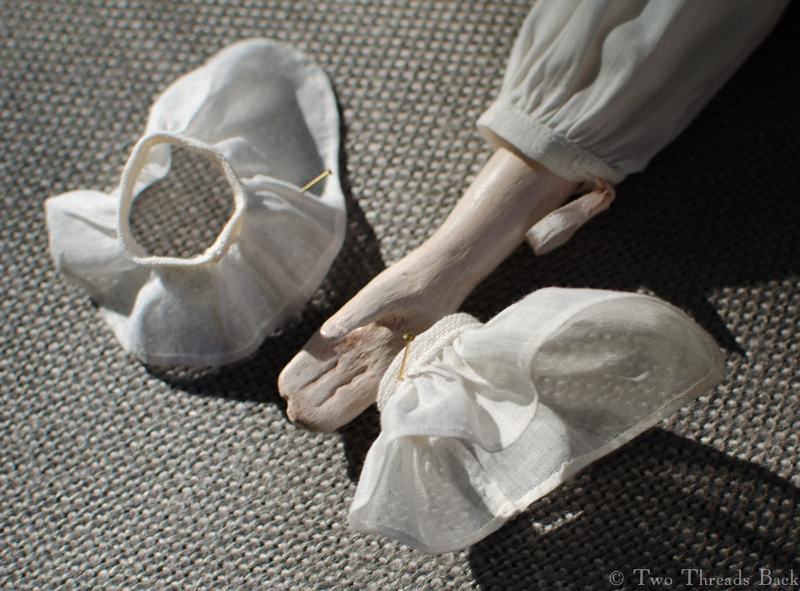 Pharaby modeling her petticoat, a last photo shoot before the freeze tonight. No more flowers till spring, I fear. She may start hinting for a wool petticoat! 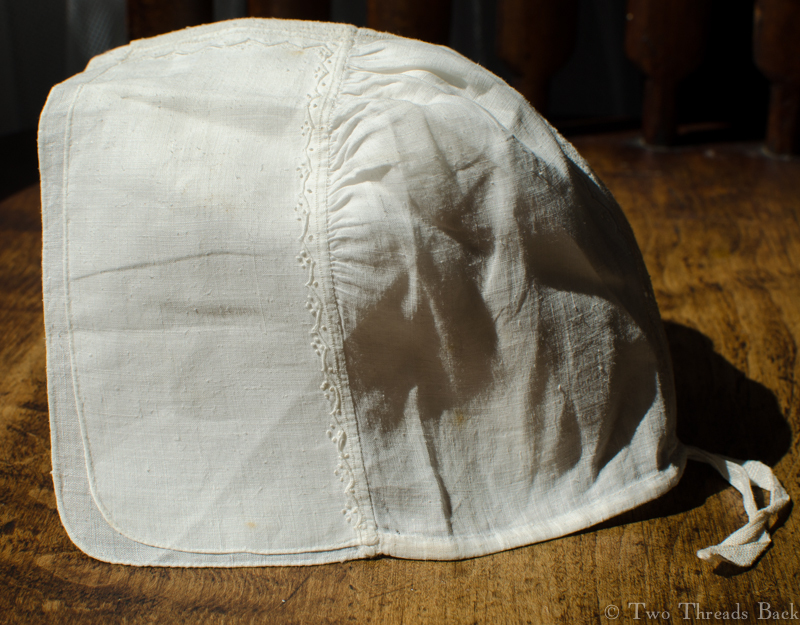 An 18th century cap for a baby, made of fine linen. If it’s fair to judge from the advice books of days gone by, enlightened physicians had an uphill battle trying to convince mothers to dress their children sensibly. The following quote is from William Cadogan in his Essay Upon Nursing and the Management of Children, 1750. 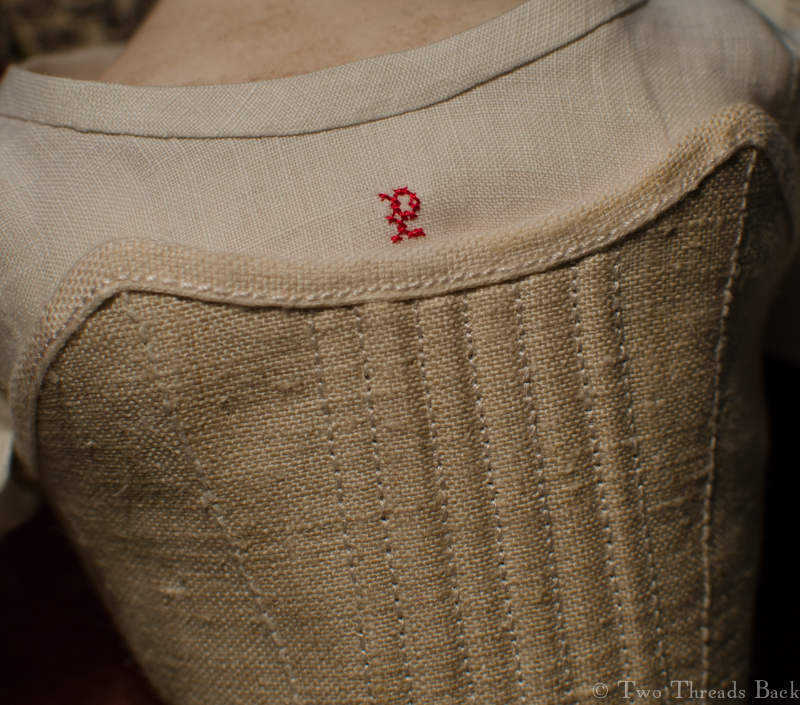 I would recommend the following Dress : A little Flannel Waistcoat without Sleeves, made to fit the Body, and tie loosely behind; to which there should be a Petticoat sew’d, and over this a kind of Gown of the same Material, or any other, that is light, thin and flimsy. The Petticoat should not be quite so long as the Child, the Gown a few Inches longer; with one Cap only on the Head, which may be made double, if it be thought not warm enough. What I mean is, that the whole Coiffure should be so contrived, that it might be put on at once, and neither bind nor press the Head at all: The Linnen as usual. This I think would be abundantly sufficient for the Day; laying aside all those Swathes, Bandages, Stays and Contrivances, that are most ridiculously used to close and keep the Head in its Place, and support the Body. As if Nature, exact Nature, had produced her chief Work, a human Creature, so carelessly unfinish’d, as to want those idle Aids to make it perfect. 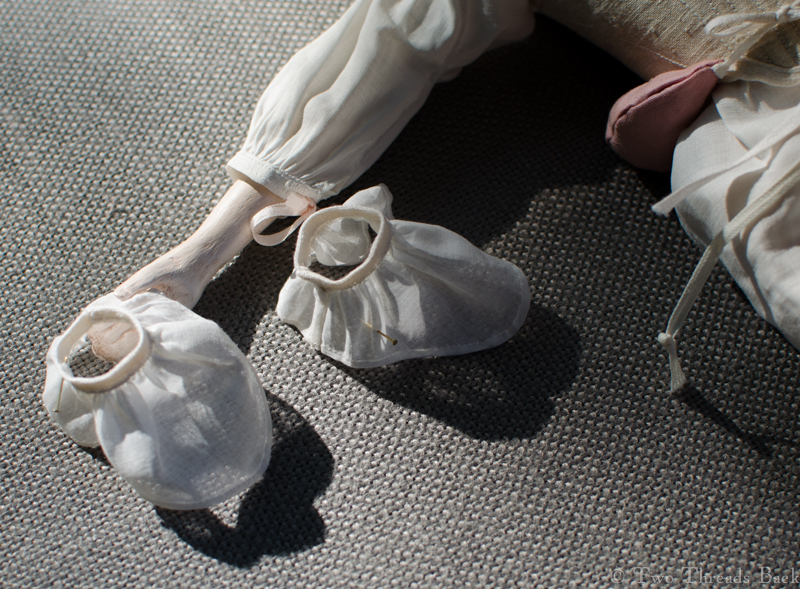 Out of all the clothing that has survived over the past couple of centuries, it seems like the finer baby garments are some of the most numerous. I guess that makes sense: they possess great sentimental value, exquisite handwork, and hey – they don’t take up much space! Baby cap, back view with ties. 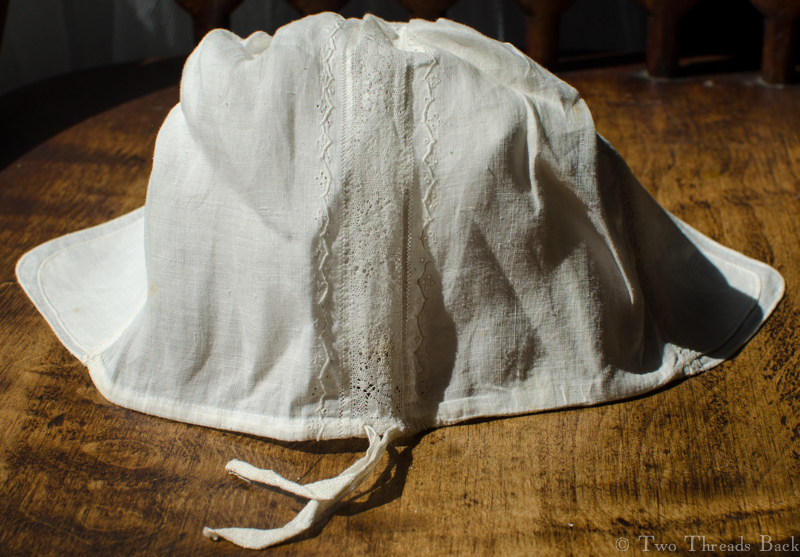 This little cap is a classic of 18th century style. It’s made of extremely fine linen (I know it looks coarse in the photos but it’s really not) with a double brim and a narrow linen tape to draw it up to fit at the neckline. There are no ties to fasten it under the chin, nor signs that there ever were. Close-up of lace and embroidery. 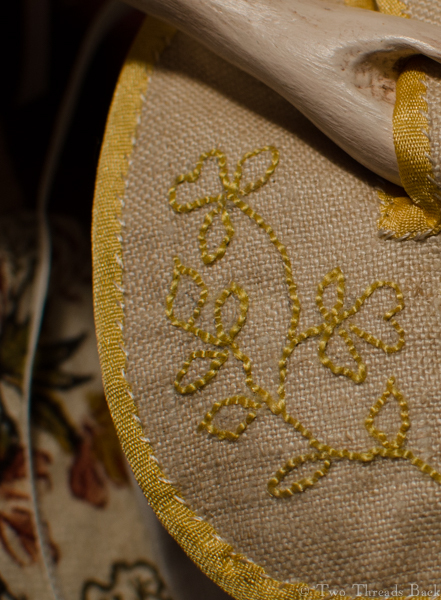 Even though I’ve laid a ruler across the needlework, the photo doesn’t really show just how minute the embroidery is. 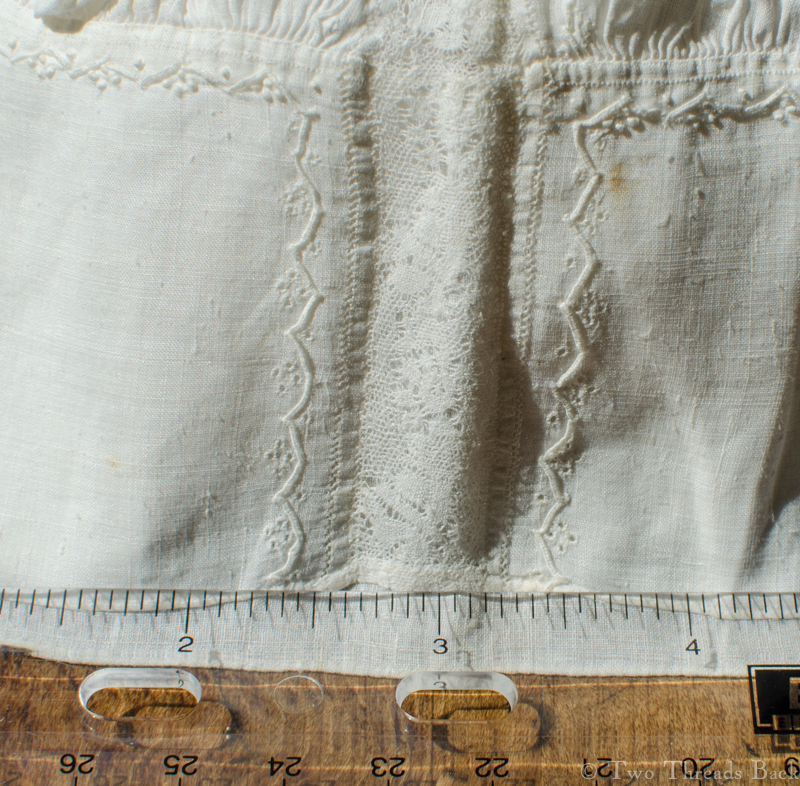 And the plain sewing is a staggering 48 backstitches per inch! The pattern of buttonholed scallops and dots is very common on baby caps and shirts of this era. 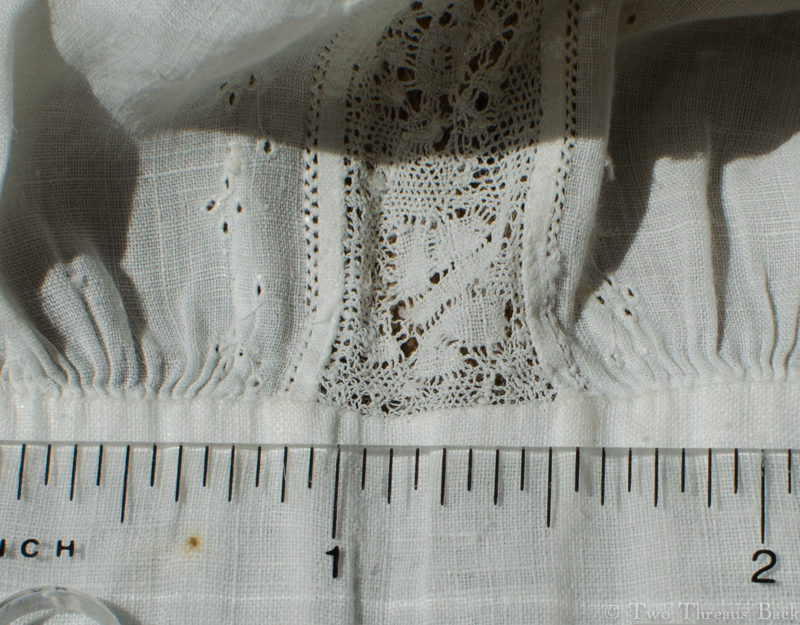 It also appears on the first “Little Biggin” I wrote about, although this one has tiny eyelets as well as dots. The lace is handmade, but not being a lace person, I can’t identify it. Help?? The brim is about 2 1/2 inches deep, front to back, and 11 inches from side to side. The two layers have been tacked together and the crown gathered and sandwiched between them. A “closer”-up of the cap from the inside. 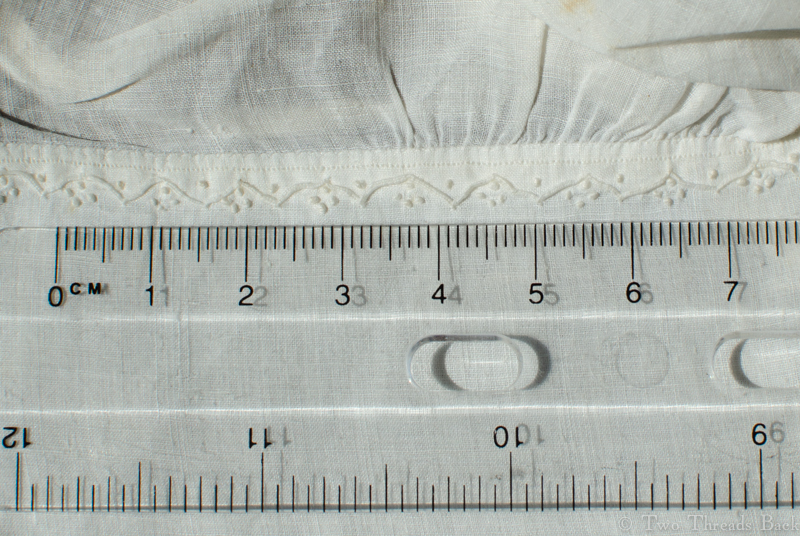 Can you make eyelets that measure 1/16″ across? I can’t even SEE them without squinting! I think this little “Coiffure” is so contrived that it may, indeed, meet with even Dr. Cadogan’s approval! Fashionable Pharaby’s new cork bum. What was wanting ? Blockhead! Don’t thee know? A BUM was wanting !! Mercy on us ! Who would have thought Nature could have made such a mistake as to create Ladies without bums. Bum-shops are opened in many parts of Westminster for the sale of cork bums, and report says they go swimmingly on. And this is what they call getting up behind. So that in fact, a fashionable female, if she lay on her face, or creep on all fours, would exactly resemble a camel with a hunch in the middle of the back…. Let it be recorded, that in the auspicious year 1785, BUMS FOR LADIES, were made, cleaned, and repaired, so as far to exceed nature in size, or convenience. When researching this little artifice, I was intrigued by the references to cork. 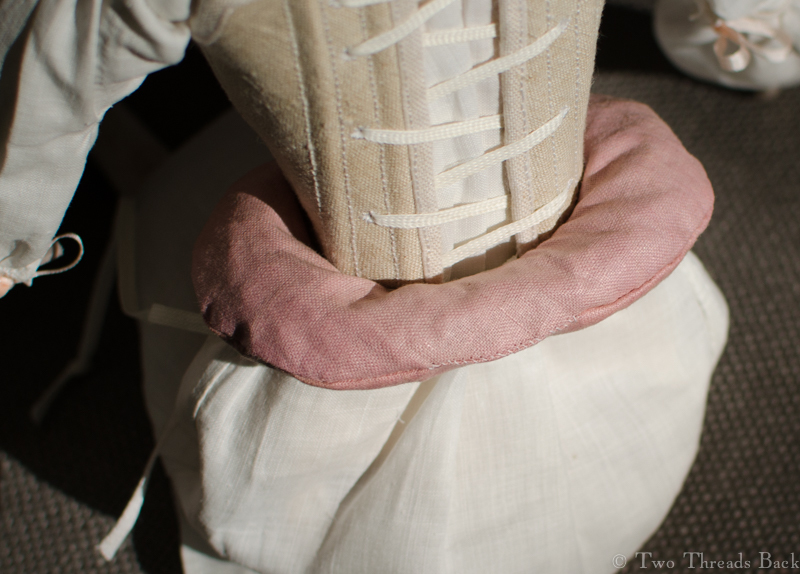 Farthingales, panniers, etc. had been around for ages and were effective in supporting heavy skirts. So why cork, and what did they look like? I found a website that provided the most amazingly extensive research on the subject of skirt supports ever — with excellent images. And another site by a brilliant costumer who experimented with using cork blocks for the same purpose. But I couldn’t find any images of extant cork “bums” to go by. So would Pharaby be happy with wool stuffing? Or would she insist on cork? You know the answer. The next question being, what kind of cork? 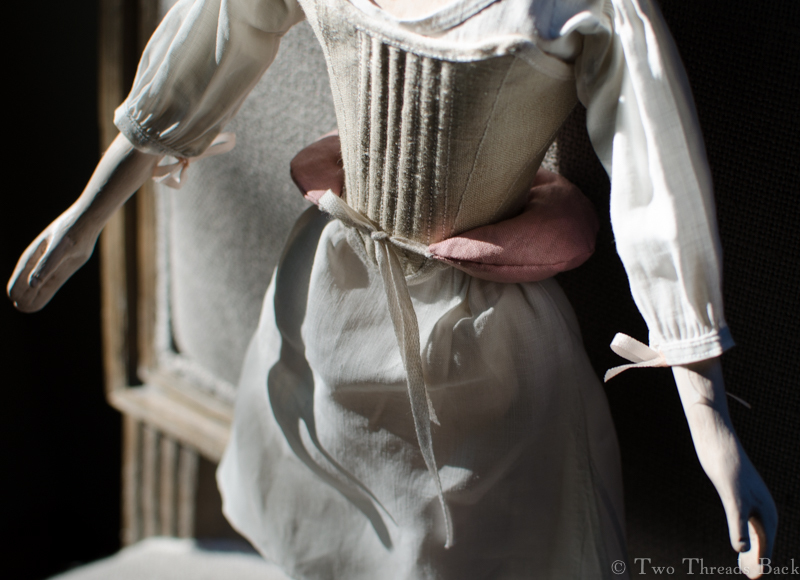 The advantage, like the disadvantage, of dressing dolls is the scale. I could use a cork coaster to try carving a shape and then covering it, but the tiny size required was more than I wanted to tackle. What if I used cork “crumbs”? 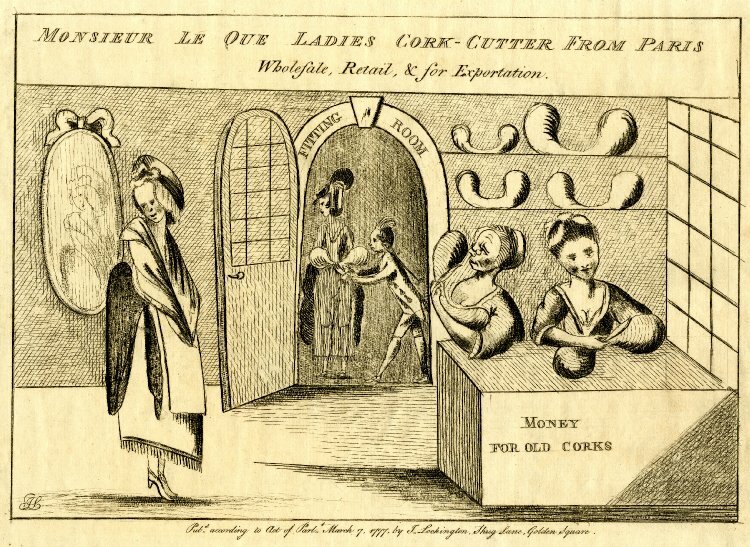 One period satire implied that cork pieces were used: “Money for your old corks.” Ergo, they were cut, shaved, crumbled, etc., and used like stuffing. Well ok, maybe not. Maybe “corks” was short for “cork bums” and they wanted them for resale or recycling. I’m speculating in an attempt to defend my choice. Whatever, we went with cork granules. Now, my husband makes wonderful wine (as a hobby — woohoo!) 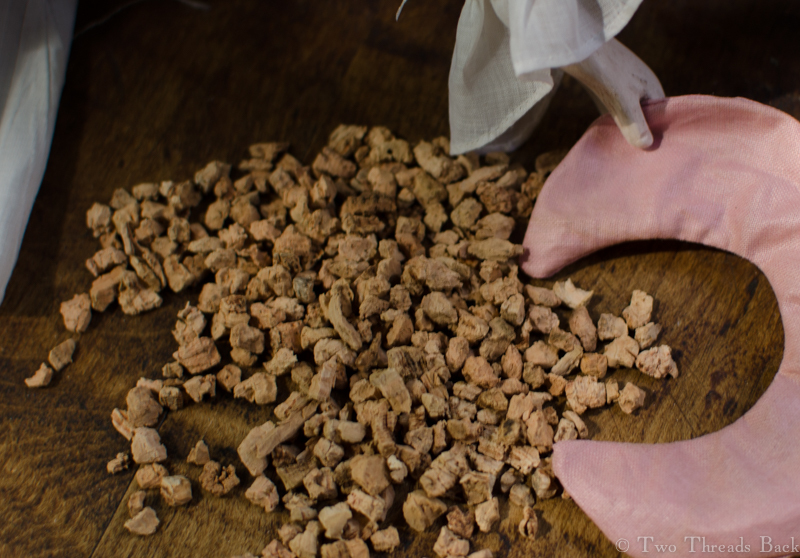 so why not crumble some corks we already have? Or chop up that trivet? Cheap, easy, and immediate, so of course I didn’t do it that way. 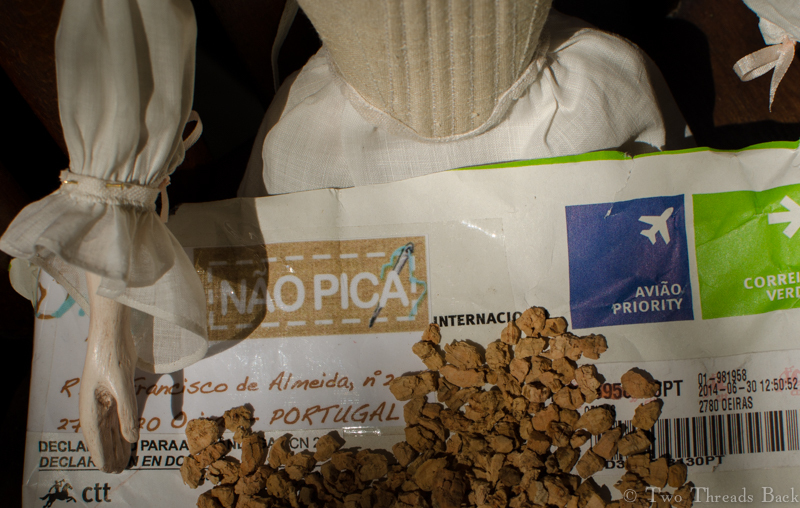 My life is pretty tame and I was craving a touch of the exotic, so Pharaby and I sent for a package of cork from Portugal. I figured I could use the leftovers later for stuffing some vintage toys, to give them that authentic lumpy look. First freehand try for a pattern, yay! I drew a pattern (and used the first attempt, I’ll have you know). I found some grubby pink glazed cotton which I’d unsucessfully, thank goodness, tried to sell on ebay. And then I stitched and stuffed and added ties. Let it be recorded that in the auspicious year 2014, Pharaby’s figure was enhanced. And she did need it. Most wooden dolls are not noted for their shapely behinds. The tricky part was getting cork from the outside to the inside. Her rear from the rear. What a corker!